Successfully Added Wireless Headphones with Integrated MP3 Player (4GB) to your Shopping Cart. What makes for the best choice in mp3 headphones largely depends on personal needs. You might need more than one set of headphones for different applications. You also want to consider practical aspects like size and portability in each set. Here we present to you, an affordable yet, high quality wireless headphones with built-in MP3 player and 4GB's of flash memory. This MP3 headset features a stylish design, and comes extremely light weight with an impressive high quality sound output. The immense advantage of such a gadget is their ergonomic design. These beautiful set of MP3 headphones are both lightweight and compact, they hold hours of music thanks to the built in 4GB of memory. Further-more, these MP3 player headphones with 4GB of RAM also come with a mini USB connection interface, meaning, with a simple connection to your PC or laptop, you can easily transfer music files to and from your computer to this MP3 headphones. If you're in the market for a pair of MP3 wireless headphones, then you've come to the right place. Stop getting tangled up in wires and set your self free with these high quality audio output mp3 headphones. Perfect for sports, house cleaning, or any other times wires get in the way. 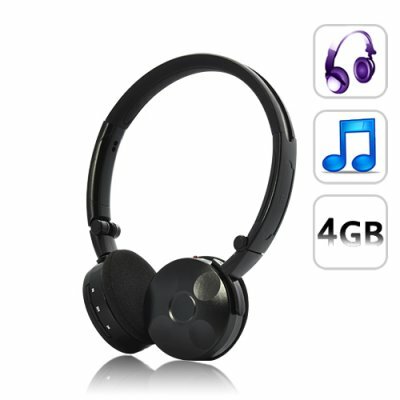 Get these amazing high performance MP3 headphone today. Simply click "Add to Cart" and Chinavasion will express ship you a sample right away. This MP3 headphones and other similar headset gadgets such as wireless headphone with MIC in this category, all make for an amazing resale item on your eBay listing page or DropShip website. Brought to you by Chinavasion. the number one in consumer wholesale electronic products. Learning a language? Load the mp3 files onto this headset. Can this wireless headphones be connected to a home stereo system and be used as a regular MP3 player? Yes, located at the bottom of the left headphone, is a 3.5 audio out port. You can use a 3.5 - 3.5 audio cable to connect this MP3 headphone to your stereo speakers. Can the memory be expanded to more than 4GB? No, this MP3 player headset only comes with 4GB of built in memory.